The first downloadable content for Watch_Dogs 2 is now avaialble on PS4 (Jan. 24 for Xbox One and PC) for $6.99 or as part of the Season Pass. T-Bone Content Bundle brings new coop challenges that can be accessed in Guest Mode, allowing non-owners to try the content. For the launch of this DLC, Ubisoft Club will run for four weeks the T-Bone Chaos Event with each week a new themed challenge and unique rewards to earn. 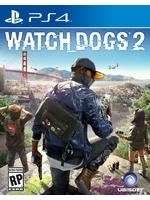 SAN FRANCISCO - December 20, 2016 - Today, Ubisoft® announced that the T-Bone Content Bundle, the first add-on content pack for Watch_Dogs® 2, is now available for download on PlayStation®4 for $6.99 and is included in the Season Pass. It will be available for Xbox One and Windows PC on January 24, 2017. The T-Bone Content Bundle revolves around Raymond Kenney, AKA T-Bone, and includes his attire, as well as his modified school bus, complete with bulldozer blade for creating extra chaos. The Bundle also offers a new Mayhem co-op challenge, with a tough new enemy archetype – the Grenadier – that uses advanced weaponry and tactics. The multiplayer features of the T-Bone Content Bundle, as well as the upcoming content packs, can be played in Guest Mode, meaning that players who own the DLCs can play co-op sessions with friends who do not own the DLC. This will keep the community united by allowing owners to continue playing co-op with their friends who do not own the DLC. Non-owners will be able to try the new content and co-op challenges before buying. To celebrate the release of this DLC, players can participate in the T-Bone Chaos Event. This free event will run for four weeks, with each week bringing a new themed challenge through Ubisoft Club that gives players a chance to earn in-game currency and unique event rewards, like new car skins or a new bag for Marcus. Access the Ubisoft Club app in Marcus’ phone and select the special event challenge to participate. Watch_Dogs 2 is now available worldwide on consoles and Windows PC.